Michel Vignaud - Le Clos***, Chablis, Burgundy, France. This ancient Clos des Hospice de Chablis on the edge of the famous wine town of Chablis is today tending to the palates of those who love good wine and superb food. 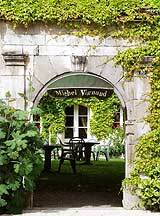 The charming old structure with its green, tree shrouded inner courtyard, is the culinary home of Michel Vignaud, a chef with a deft touch whose main clientele are the wine growers of this world famous town. While he is more than capable of producing some country favorites such as veal kidneys seasoned in its own fat and lightened with wine of Chablis, M. Vignaud delights in creating lighter, more interesting dishes from his imagination. His establishment is first and foremost his restaurant. Secondly it is a modest hotel with 26 rooms all comfortable with modern bathrooms and TV to which to retire after a leisurely and delicious meal or an energetic day visiting and tasting at the many varied "dégustation" rooms of the town’s wineries. We have used the Le Clos as a stopping place when we first arrive in France and head south. Just about 3 hours from Charles DeGaulle and about 6 hours from Aix-en-Provence, it is an ideal spot, quiet and peaceful, to either get over jet lag or to gear up for it. The town of Chablis is a lovely example of what a small wine town can be. With the river Le Serrein meandering through the middle of town and the Chablis vineyards covering the gentle hills that surround the town, a more pastoral scene could not be found to aid in unwinding. Salmon trout with fresh vegetables. A typical meal might start with an "amuse bouche" or palate teaser such as poached scallops and mussels with fresh tomato chunks in a light saffron sauce. 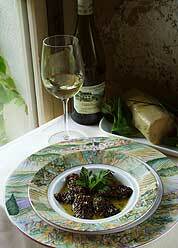 Morels in a light juice sauce stuffed with Foie Gras followed. Or perhaps the unusual sautéd scallops on a bed of the most unusual greens with small heaps of fresh, finely chopped tomatoes. 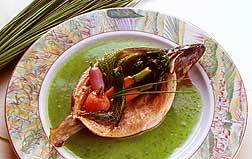 Then salmon trout opened as a bowl filled with perfectly cooked small vegetables. This might be followed with the most tender breast of duck served with fresh whole vegetables and paper thin potato pancakes. 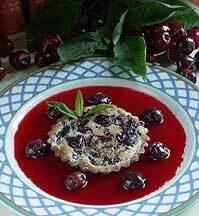 A wide selection of cheeses is rolled to the table for your pleasure and then mouthwatering desserts such as his cherry tart in a berry sauce. He is one of the few chefs who is still serving labor intensive desserts. In spring 2006 we enjoyed a fabulous paper thin crust apple tart with a circle of thin sliced fresh apple slices baked golden, served hot. Ahhh! Naturally, if you order coffee a tray of sweets arrives with it. The apparent simplicity of his food belies the perfect orchestration of tastes and refinement involved in the elegant preparation. His wine cave has a large selection of the finest wines of Chablis both expensive and reasonable. The wines of Chablis bear little relationship to those called "Chablis" from the United States. Within this small wine region, the tastes can vary from strong and fruity to light and smooth. Like the wines from the famous region between Dijon and Beaune, small changes in location make a big difference in taste. The old entrance to the cloistered courtyard, not filled with trees, grass, flowers and garden furniture. What we did notice on our Spring 2006 visit, is that while the restaurant meals and service is still excellent and the rooms still pleasant and comfortable without costing an arm and a leg, the wonderful buffet breakfast (he was one of the first to lay a lush spread for breakfast) has been reduced to a shadow of its former self. And miserable coffee! A major disappointment. No cerials at all. We had to go over to the little mini-market to buy a box so we could have some. A silly way to save a few sous. Otherwise, an excellent place to stay outside of Paris.